Geniet van prachtige zonsondergangen vanaf je eigen balkon, een woonkamer en keuken! Dit een slaapkamer, een en een half bad slaapt zes met een kingsize bed, queen-size slaapbank, stapelbed in de hal alle nieuwe 20 door 20 Italiaanse tegelvloeren, alle nieuwe flatscreen-tv's met meer dan 100 channnels & Wifi !! Twee telefoons, twee televisies, Air Conditioning, twee opzetbaden, twee zwembaden, picknickplaats, Barbecue Grills, Tiki Bar, Snackbar, Convenience Store, Kapsalon, Arcade, 24-uurs beveiliging, wasmachine en droger faciliteit ter plaatse, niet roken aub !! Dave’s condo was great. Everything we needed for a great spring break in PCB!!! Perfect! Need I say more? David is caring, friendly, and honest! 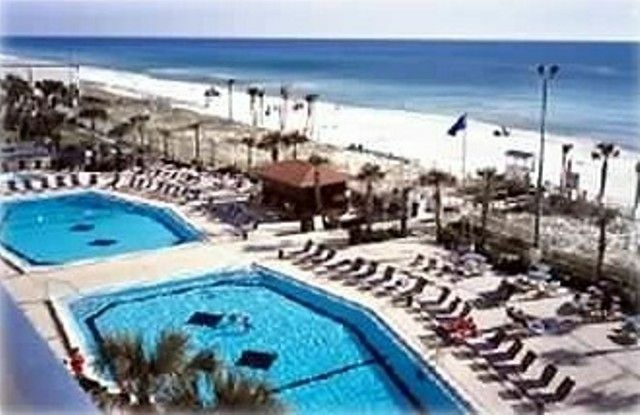 Although we have been renting at PCB for several years, he suggested new places for us to eat since he is more knowledgeable of the area. He likes to stay in touch before and after...we will likely be back!!! Our stay was wonderful! David was so easy to work with, out going and friendly. He also recommended great places to eat while in town, which they were fabulous! The condo was very nice and clean. I would recommend this condo and plan to stay again!! Really enjoyed our vacation at this condo. Updated and clean, fully stocked kitchen which made it easy to stay in after a day on the beach. Fast and friendly responses from the owner. Would recommend ;) ty David! In love with Panama City Beach! Amusement & Water Park, Go-Cart Rides, Waverunners, Super Wal-Mart, het is allemaal hier! Absolutely no cancellations, no refunds within 30 days of arrival ! Rental is Saturday to Saturday. Tax must be paid with final payment. Also a separate security damage deposit for damage is due 30 days before arrival.